Hi and welcome to HLF, jameskimo. There are typically two types of crab traps; one which is a square net that spreads out by two pieces of cane that intersects at right angle and the other is a fully caged trap that crabs can enter from two opposite entrances. 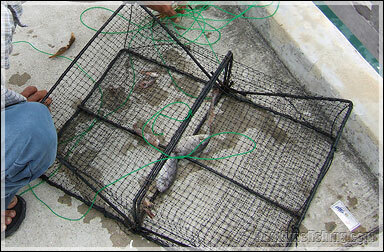 The first one is cheap, more portable while the latter is bigger and crabs have no chance of escape once in the cage. It can also sometimes trap fishes as well. In both types of trap, you need to put bait to attract the crabs to come. Crabbers usually use a big chunk fishhead that can be bought from the wet market as bait. You can also use pieces of fish meat, or small fishes as a hole if you like. Basically, the crab is attracted by the scent of the flesh. If you're only into crabbing on your fishing trip, you might want to consider bringing a few to deploy it over a range of area to yield better results. Check every ten minutes or so. If you're not getting any crab, try to deploy it in a different area or wait slightly longer before checking again. Flower crabs are way more common than mud crabs as they are more adaptive to different kinds of habitat. You may particularly find them in places where the seabed is sand and/or mud. They are happy in brackish water as well as water with high salinity. Mud crabs however, favour more estuary habitat. Places with brackish water or mangrove swamps are good place to find them. They may also move into canals as far as the tide can reach. The best bait to catch crab ... use either tenggirri or ang go li fish head. Or ... any other fish head available. Cane type better hehehe . 1. where to get the cage? hw much per cage? 2. where's the bestest plc to get crabsssss? Welcome to HLF kornium. 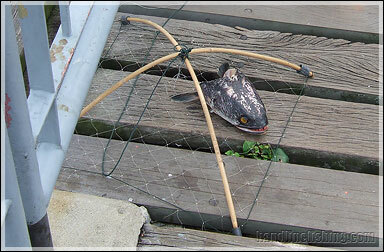 You can get those cane crab traps at just about any tackle store. Drop by beach road, there are many tackle stores along there. I'm not into crabbing but according to dBs, they cost around 3 dollars each and you may want to consider getting a few, and possibly ask for a discount. If you're trying out for the first time, you might want to go for Sembawang jetty. You pretty much will get something there, just that most of the crabs there are quite small. There are both flower crabs and mud crabs there though most of the time it will be flower crabs. Most of the tackle shop sell the crab net. Cane type is cheapest and easiest to use too. All you need is a cage with a nylon string long enough to lower down to your crabbing spot. Use either ang go li or just about any type of fish head. You might want to try out Punggol jetty too. Seen people landed nice size mud crab there. Good luck and do post up a CR to share.